As I've said over and over again, it seems like food in Vancouver comes at us in waves. 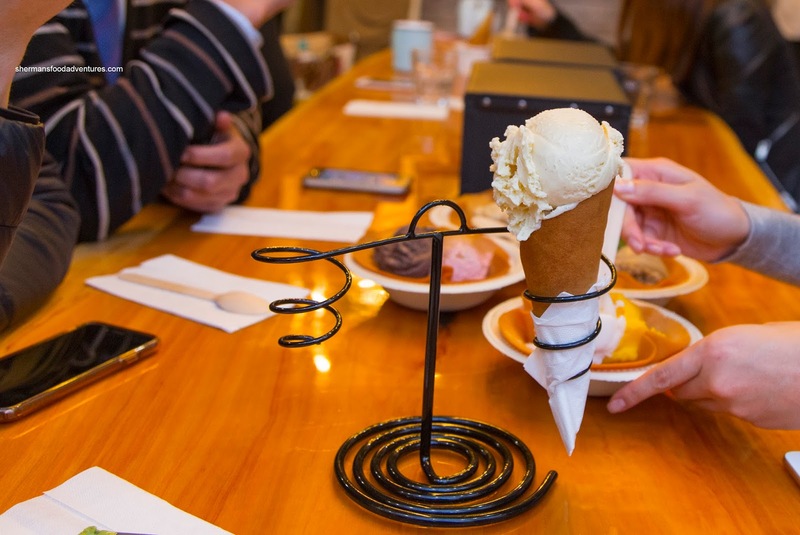 We've seen it with ramen, macarons and gelato where something gets hot and many other related places seemingly spawn overnight. 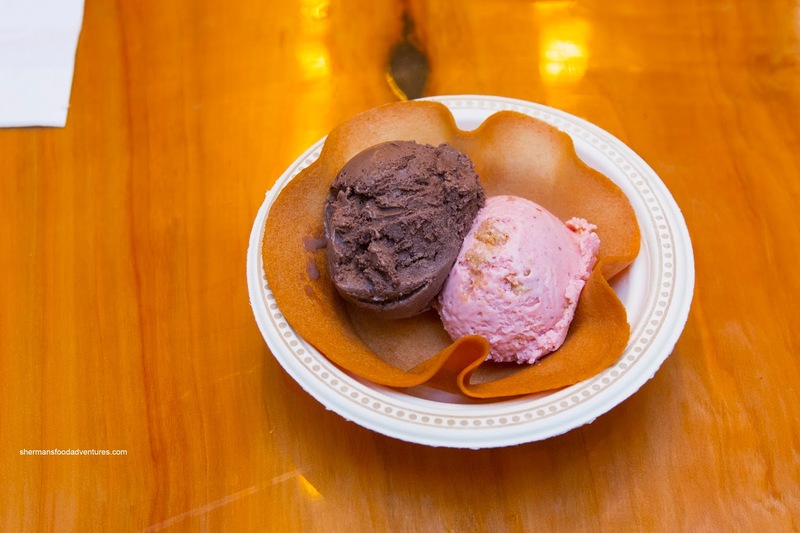 Now the ice cream scene has been somewhat of a slow starter as we've seen Earnest and Rain or Shine grow to 2 locations respectively in the last few years. 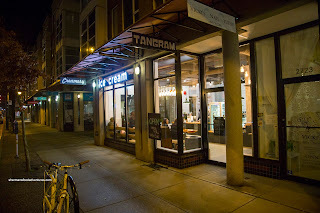 Now up to bat is another contender in Tangram Creamery out on Arbutus. We were invited for a tasting where we decided to try one of everything (this was after Q Shi Q!). 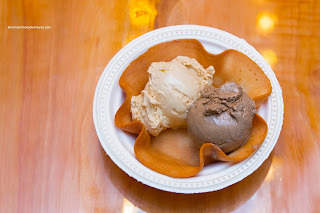 We started with the Salted Caramel and the Guatemala Coffee served in a waffle bowl (within a paper bowl). As much as the saltiness really came through in the salted caramel, it only further exacerbated the heightened level of sugar. It was smooth and creamy though. The coffee ice cream was pretty impactful as every spoonful tasted like drinking creamy coffee with a slight bitterness. It was less sweet than the salted caramel. Next 2 consisted of the Double Chocolate and Strawberry Strudel. Although the chocolate was pretty sweet in its own right, the amount of flavour packed into each spoonful was evident. I enjoyed the noticeable chocolate hits, but the sweetness did hide the bitterness. I was a bit indifferent with the strawberry as it didn't capture the essence of real strawberries. I guess once again, it was due to the sugar. One of my favourites of the bunch was the Hoji Cha as it really did taste like the tea. As much as it was sweet, the roasted flavour of the tea really came through, particularly in the finish. It was pretty smooth and creamy which made it even more appealing. Interestingly, the Matcha was not as creamy and a bit firmer. It was surprisingly mild where the colour didn't really match the flavours. I could've used more bitterness from the tea. 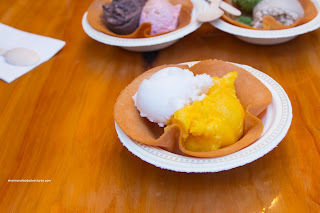 We moved onto the Lychee and Mango Sorbets next. 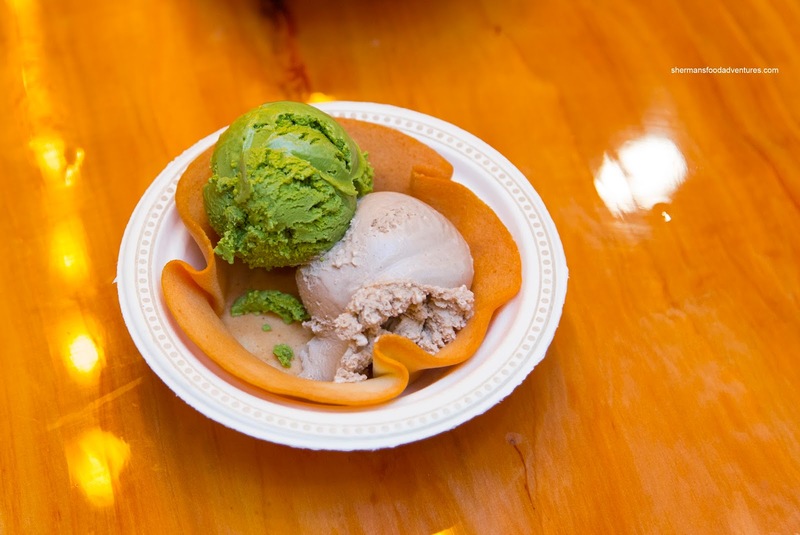 Nicely blended, the lychee sorbet was smooth, sweet and natural-tasting. On the flip side, the mango was a bit clumpy and didn't have a solid mango essence. It could've been possibly due to it being Winter and good mangoes are hard to come by. I know I sound like a broken record here, but the Vanilla served in a waffle cone was super sweet. As creamy as it the ice cream was, we couldn't get much of the natural vanilla flavour due to the sugar content. 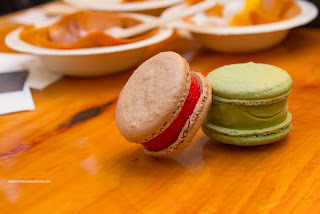 Our last 2 items consisted of the Strawberry Sorbet Chocolate Macaron and Green Tea Macaron. At first, I was nervous about trying them because these are the type of products that often look good but fail miserably. To my utter surprise, these were really good. I particularly like the sorbet as it was refreshing and tasted like real strawberries. The macaron itself was a bit chewy, yet was crispy on the outside. It held up to the wet ingredients quite well. This was a nice end to a hit and miss tasting. There is potential here as long as there is some consistency to the products (and lessening of the sugar content) in the future.